Running out of device space is a huge annoyance, especially when you’re shooting pictures or video that you suddenly realize you don’t have room to keep. You can solve that storage frustration once and for all with the iKlips DUO, a flash drive designed with Apple mobile devices. Right now, you can get this ultra-fast, ultra-lightweight drive for as little as $69.99 with this offer from TNW Deals. 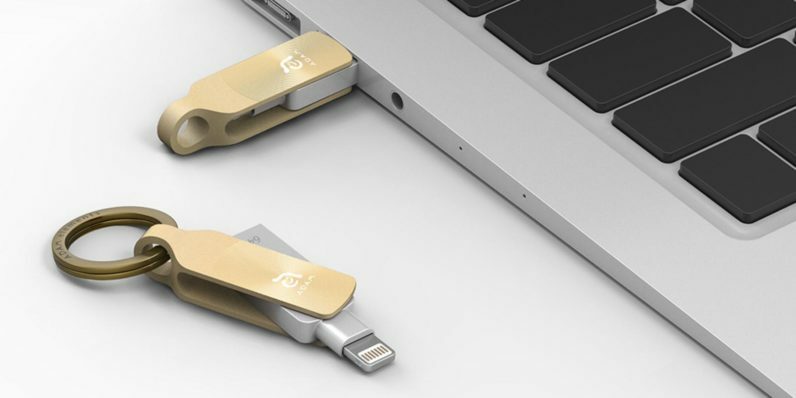 With its dual Lightning-USB 3.1 interface, the iKlips DUO plugs into any iPhone, iPad, Mac, or PC device — offering easy file transfer and storage of files between devices. Through the iKlips 3.0 app, you can quickly preview all your files and decide which you want to back up, or even even save space-consuming video directly to iKlips memory while you’re shooting. Engineered for portability and durability, the iKlips DUO clips easily to a keyring or bag, ready for use at a moment’s notice. The drive also offers password and fingerprint protection options to keep your files secure, along with advanced features like direct photo backup, 3D Touch support, and full integration with Facebook, Instagram, YouTube, and Apple apps. Grab the iKlips at any of three storage capacities: 32GB ($69.99), 64GB ($88.99) or 128 GB ($153) varieties, all marked down with this limited time deal from TNW Deals. Be sure to choose from three colors — red, black and gold.